The Brit’s oldest friend lives in a very upmarket and trendy part of London called Canary Wharf. He and his partner are both huge foodies and wine buffs. The Brit and I were both excited to dine with them, as we knew it would be a special night out with great food, wine, and friends. 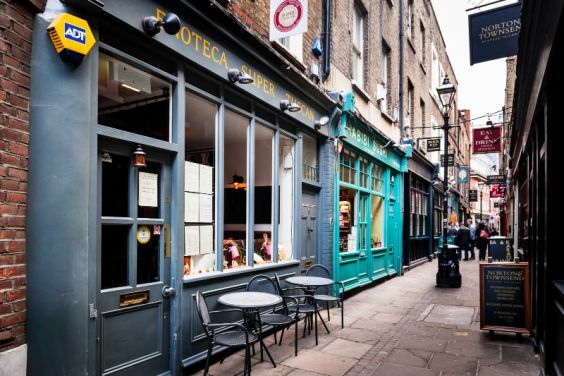 Our friends took us through London back streets and an alley to one of their favorite Italian Restaurants: The Super Tuscan. Apparently, they eat there regularly and know the adorable Irish waitress. She was hilarious and kept us laughing throughout the meal with her remarks and witty banter. The restaurant is tiny, so I would highly suggest booking a table if you visit. It seemed to me as though they may have had only eight tables or so for their diners. As these are close friends, we felt comfortable in telling them that we wanted to just share different dishes which gave us the opportunity to taste more from the chef. We ordered the following selection: Congilio (rabbit stewed with olive, butternut squash and celery), Burratta (a warm bacon and cheese salad with roasted eggplant and sun-dried tomatoes), (Special of the night) Fettuccine with butter sauce and finished with shaved truffles, Tortelloni Funghi (mushroom tortelloni in a cream sauce finished with parmesan), Pollo alla Griglia (grilled chicken salad with a balsamic reduction on a bed of potato and finished off with rocket leaves, and finally a Saliciece con Lenticchie (rustic french sausage served on a bed of rocket and lentils). It was an amazing spread of food. We all tucked in and ate hungrily sharing our plates with the table. My first bite was the rabbit; it was moist, succulent, and tender with a rich flavor. 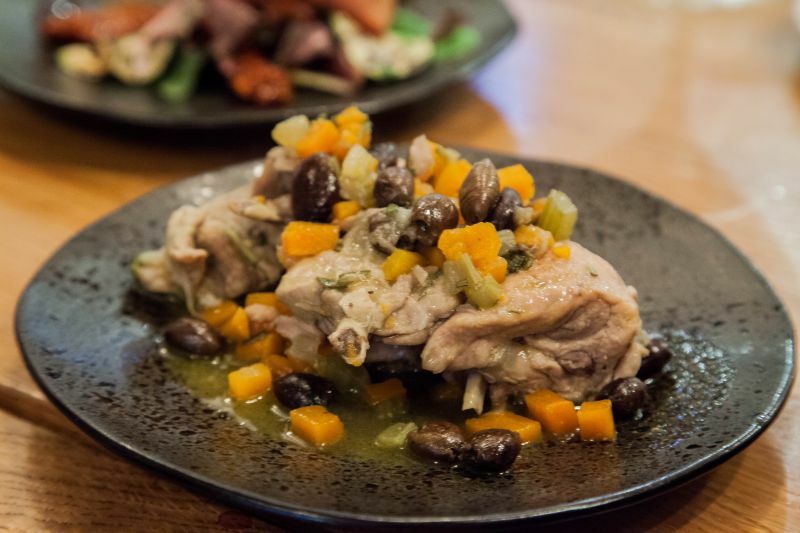 I am not a huge rabbit fan, nor do I like olives, but the dish worked. It was rustic and filling. My next bite was the torteloni. This is a dish I make at home, so I get picky about it. This version was outstanding. Nicely cooked pasta with a good amount of filling and a good blend of flavor. 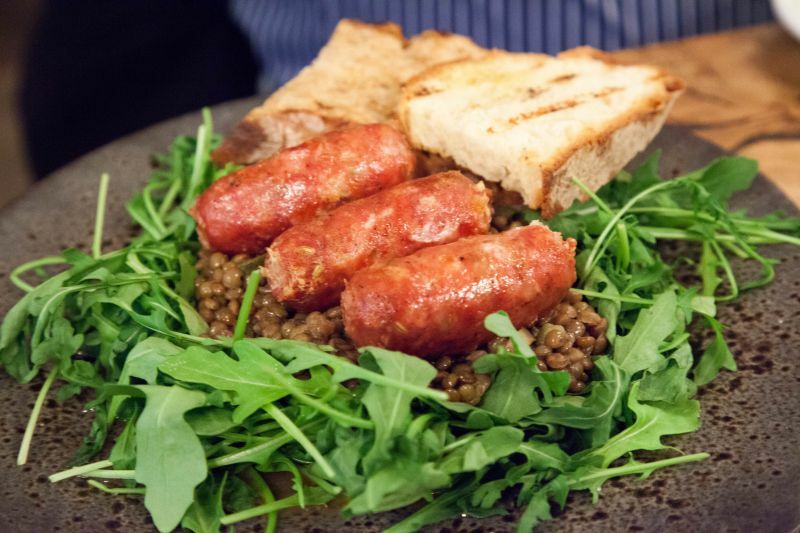 I was very surprised when I took a bite of the rustic sausage dish. I am not a huge fan of lentils served as the carbohydrate with meat, but this just worked. The flavor of the sausage was amazing. The rocket gave the dish a bit of peppery spice and kept it from being ho-hum. I would order that again. The prosciutto and mozzarella salad was wonderful. 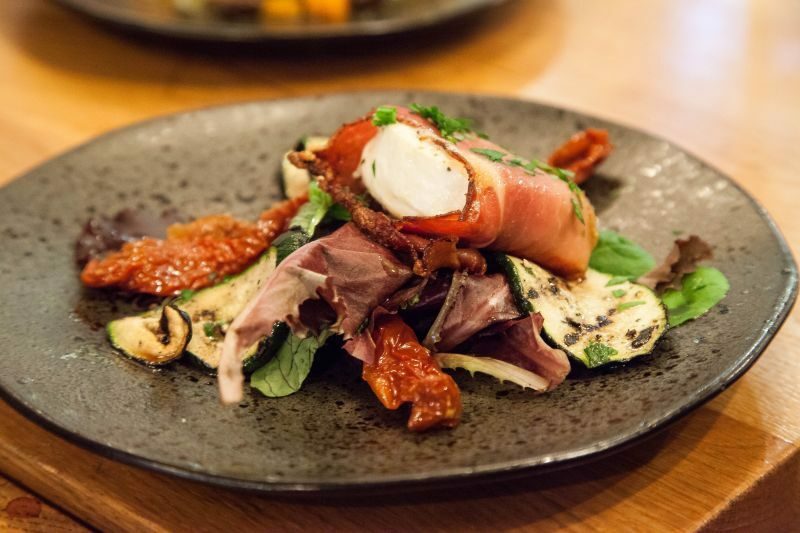 I liked the salty texture of the prosciutto with the mozzarella cheese and the mixed leaves with the sun-dried tomatoes and grilled eggplant. The chicken escallops with the balsamic reduction won me over though and edged out the prosciutto and mozzarella. 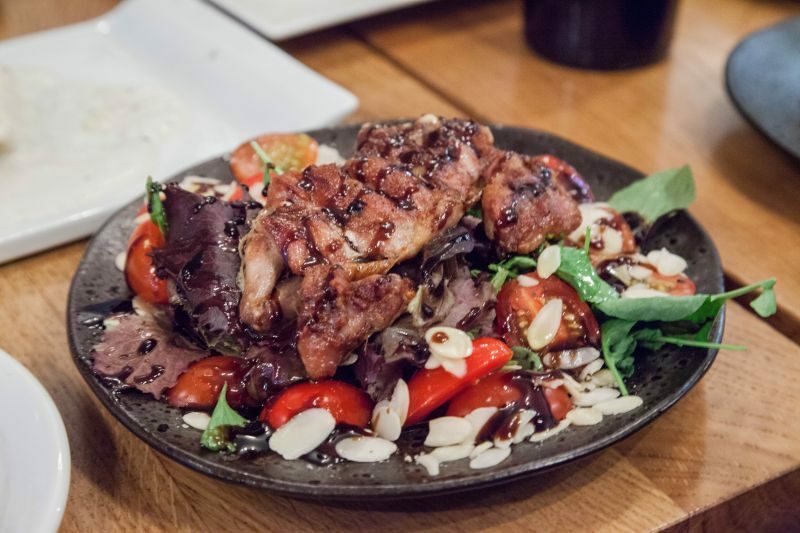 I liked the meaty chicken thighs that were grilled till juicy in contrast with the reduction glaze. The cherry tomatoes and the blanched slivered almonds rounded out the plate. Delicious! 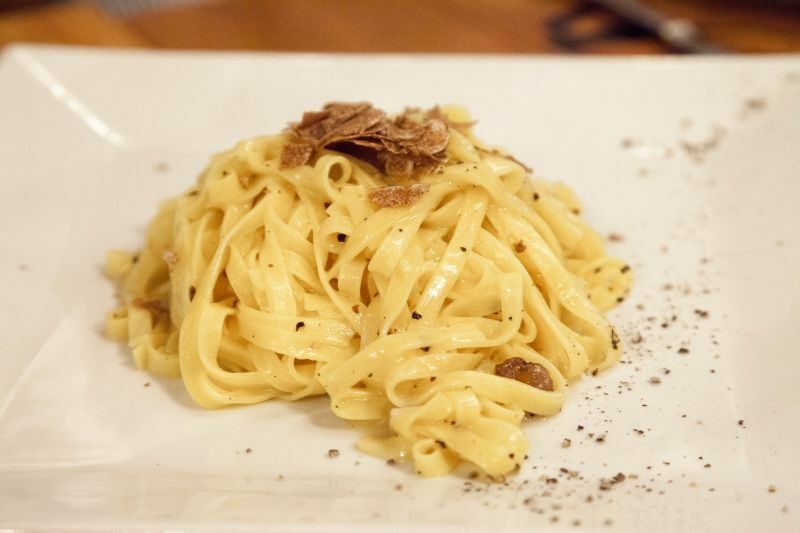 And last but not least was the fettuccine with the shaved truffles. We don’t get such a wonderful treat often, but it’s an amazing joy when we do. This dish hit all the notes for me. I don’t think I would have been as happy with an entire plate of it to myself as the flavors are very rich and satisfying. A little goes a long way. Yummy! 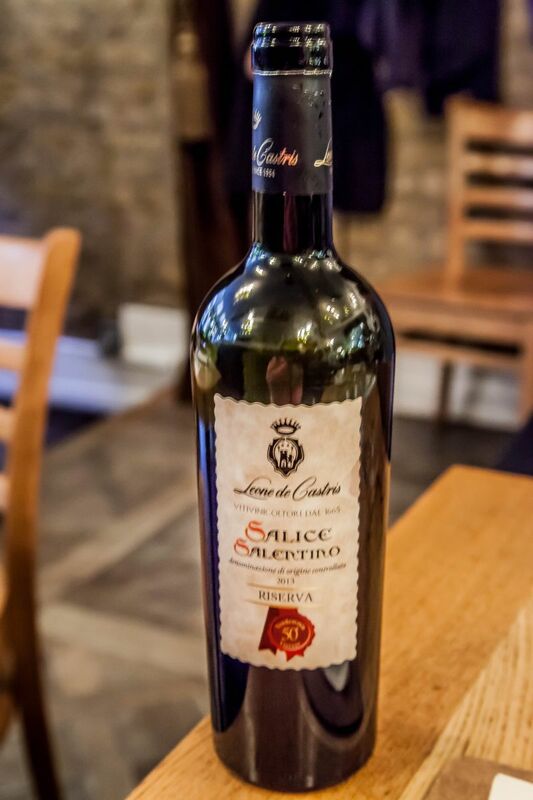 With our meal we ordered a couple of bottles of great Italian wine: Leone de Castris 2013 Salice Salentino. It was like heaven. Every single thing a perfect Italian red should be; strong fruit flavor, smooth, rich, high acidity, and a lingering finish. It was a wow. I would be happy to drink that again any time. It was a wonderful complement to our meal and evening together. 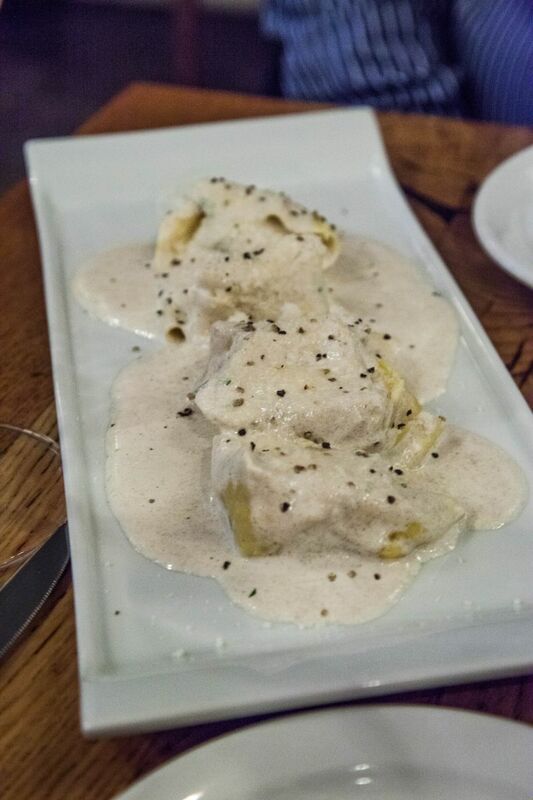 Of course no good Italian meal could be complete without dessert. 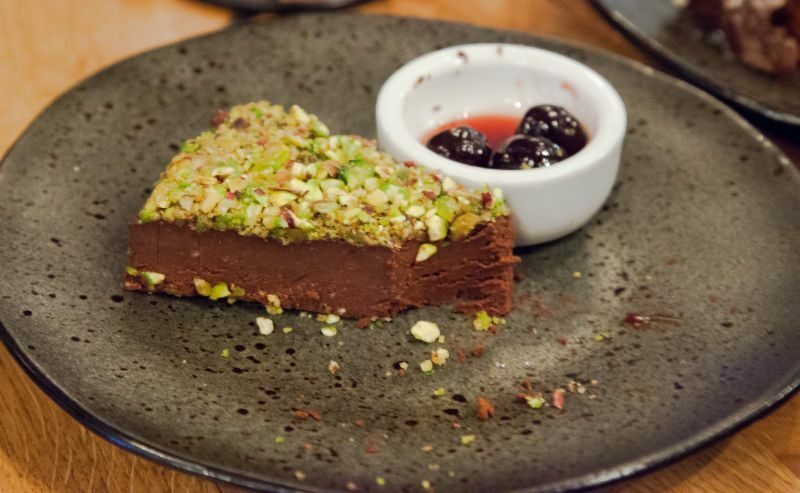 We ordered the flourless chocolate cake with a pistachio crust and stewed cherries on the side. We also ordered a traditional Italian almond cake. 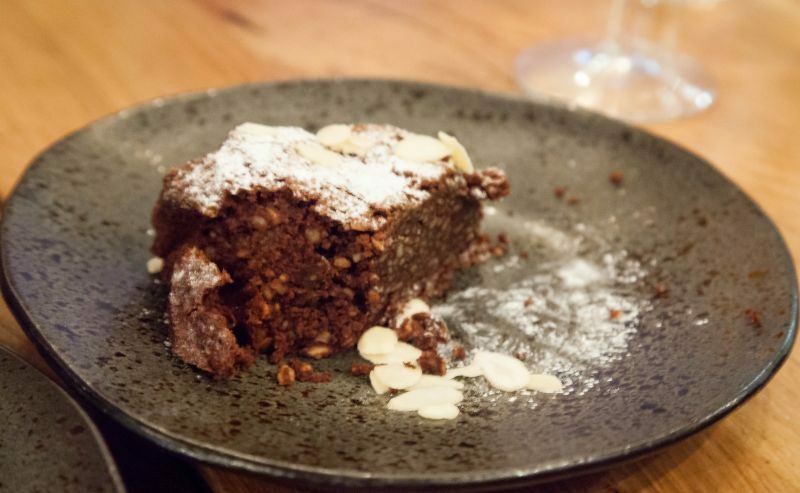 The almond cake was good, a bit dense and dry for my taste, but the flourless chocolate was amazing. Creamy, dark chocolate, and those amazing cherries to lift it. What a knock out that was. I would highly recommend this restaurant to anyone in the London area. Amazing food, great service. This meal looks out of this world! Start to finish including dessert. It truly was.. so wonderful!